There are lots of different borides; the above is an example of one possible product. The post-reaction mass is ground up and subjected to dilute hydrochloric acid to react away the borides and other products to leave elemental boron. The goal being to leave boron as the only remaining solid. The whole focus of this new video is on purity. I wanted to make a nicer element sample than my first try. 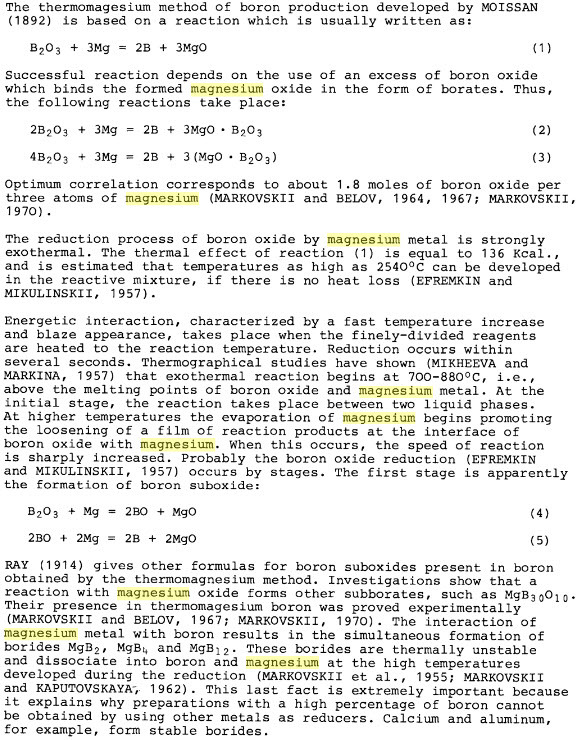 However I've been doing a lot of research recently and it appears that the magnesium reduction is really not a great path to follow if you want pure B.
Moisson noted that one of the two magnesium borides formed is as resistant to water and hydrochloric acid as elemental boron causing difficulty in making pure boron. However, he was able to make 98.30% pure boron using several purification steps. The preparation of crude boron with a 90 to 95% purity practised even in the twenty-first century is called Moisson Process. Unfortunately that means that the acid digestion step will be ineffective at separating out all of the borides. I could find no other references to the Moisson Process he mentions, so I don't know what's involved with purification there. 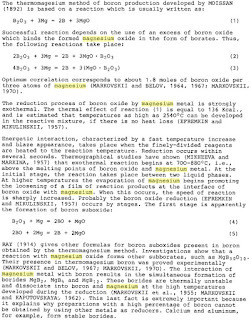 Boron does not react with water at ambient temperatures. The powdered amorphous form, however, reacts slowly at 100°C producing boric acid. The amorphous metal reacts slowly with dilute mineral acids at ambient temperatures; the crystalline form is inert. The former, however, reacts vigorously with concentrated nitric acid. The amorphous powder ignites in oxygen at 700°C. Powdered amorphous B is what is produced in just about every type of synthesis, or at least the amateur-friendly ones. I considered trying other acids to get rid of borides, but the above shows that I'll be losing some B to the acid no matter which one I use, and hot sulfuric or nitric are particularly bad. So acid treatment is not ideal. Amorphous boron is produced in a Moisson process from boron oxide and magnesium. Both raw materials are mixed and ignited to start the strongly exothermic reaction. An excess of boron oxide is used as reaction moderator. The reaction block is cooled in a water basin and then crushed in a jaw breaker and a roller crusher. Hydrochloric acid is used to remove remaining magnesium oxide and incompletely reduced boron oxide from the raw boron. The excess of boron oxide is collected as boric acid. 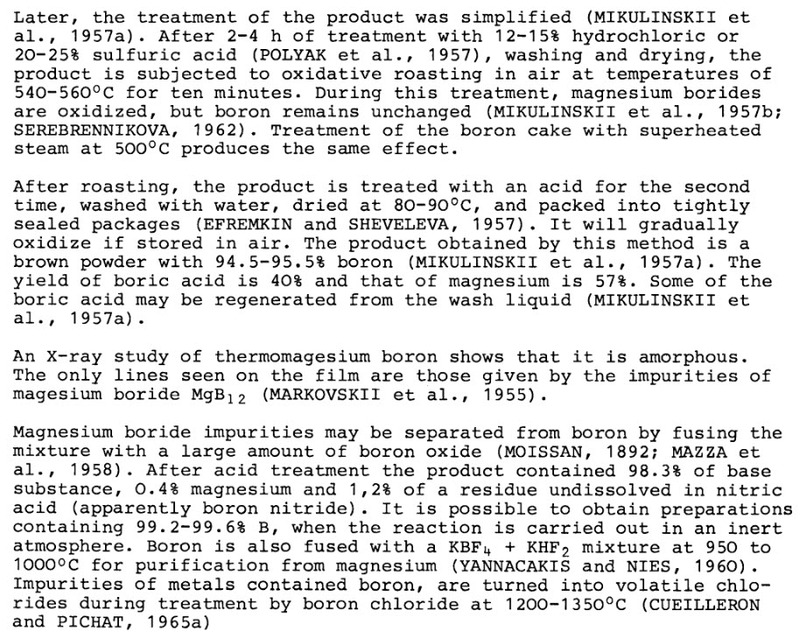 The boron is dried in fluidized bed driers to get boron with boron with 86%. Using a higher excess of boron oxide another grade with 90% boron content is obtained. 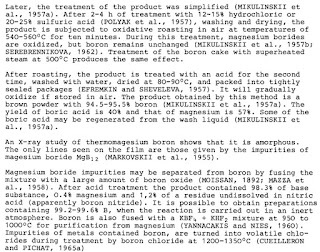 The 86% boron grade can be cleaned further in a thermal treatment step with fluorides to convert insoluble by-products into soluble compounds which are again removed by washing with hydrochloric acid to obtain boron with 95-07% boron content. So it's possible that using an excess of boric oxide may help with purity, although you still run into the problem of some borides not being digestible by acids. Crystalline boric acid is used with a crystal size of the order of 100 microns and a purity of 99.9%. 4.5 kg of this acid are fed into a stainless steel reactor fitted with a stirrer, condenser, interspace for circulation of a diathermic fluid and a device for creating a pressure less than atmospheric. While slowly agitating the solid mass, the reaction pressure is reduced to 20 mmHg and the temperature is raised to about 115° C., over a time of 30 minutes. Abundant water vapour development commences at this temperature. The temperature is raised gradually over a time of about one hour to 140° C., the temperature at which water vapour development tends to substantially subside. Finally, the mass is heated to 150° C. at which heating is interrupted. 3150 g of orthorhombic metaboric acid are recovered from the reactor, with a yield of 98% with respect to the boric acid feed. This metaboric acid is heated rapidly while stirring to 150° C. in the apparatus used for the first stage, and the temperature is then gradually increased by 2° C. every 10 minutes to about 205° C. During this treatment there is an abundant development of water vapour, which tends to subside beyond 205° C.
The temperature is finally raised from 205° C. to 250° C. over a time of 30 minutes, at which heating is interrupted. 2370 g of boric oxide are recovered from the reactor with a purity of 99% and a yield of 93% with respect to the boric acid feed of the first stage. The boric oxide obtained in this manner is in the form of a light, spongy friable mass which is removed without the need for mechanical action to separate it from the reactor walls. So it might be worthwhile to try dehydrating my boric acid as I did previously, then taking the glassy product and subjecting it to higher heat in the furnace. Finally, I found one more good book on boron: Boron and Refractory Borides, edited by V.I. Matkovich. Lots of great information there to digest. The main point, I think, is that an excess of boric oxide is required. It even mentions my experience of the 'explosion' in the video: "Energetic interaction, characterized by a fast temperature increase and blaze appearance, takes place when the finely-divided reagents are heated to the reaction temperature." Neat! That's it for now. All of this will inform my future boron experiments, and if I get a product of suitable purity I'll definitely make another video.